This weekend brought me to Cannes and the French Riviera for the MIDEM Music Hack Day where I’ve spent about 40 hours working on my music hack called Cannes Burn. Cannes Burn is a visualization that accompanies the song Burn by Ellie Goulding. Go check it out if you haven’t already seen it before reading on. It requires a modern computer and browser that supports webgl. The Hack uses the new ENsync.js library that I created last week. ENsync uses the Echo Nest analysis to provide synchronization of a JS web app with music. With ENsync you can setup elaborate animations that are triggered by musical events (such on every bar, beat or tatum). The Hack also uses threejs – the amazing 3D library by Mr.Doob. Creating the hack was a whole lot of fun – I spent hours building 3D shapes out of flying cubes. I probably listened to the song Burn many hundreds of times this weekend. (Thanks to my hacker neighbors who put up with my endless Ellie looping without complaint). It has been a great weekend here in Cannes. It is so inspiring to be surrounded by a bunch of really smart folks who are passionate about music and technology and see and hear how they are building their stuff. Such a great, sharing vibe from all of the hackers. I feel really lucky to part of it all! What is a Music Hack Day? For more info on what a Music Hack Day is like read: What happens at a Music Hack Day. I hope to see you all at one of the upcoming events. **It is strange how a non-hacker made it onto the thumbnail for the Sydney video. Dude, It’s Sydney Australia, not Sydney Lawrence ;). Chicago – September 21st and 22nd – this will be the first ever Music Hack Day in Chicago. Bologna – October 5th and 6th – in collaboration with roBOt Festival 2013. 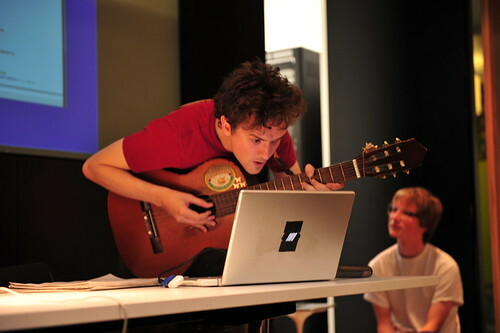 The first Music Hack Day in Italy. New York – October 18th and 19th – being held in Spotify’s nifty new offices. There will no doubt be more hack days before the end of the year including the traditional Boston and London events. You can check out the full schedule and sign up to be notified whenever at a new Music Hack Day is announced at MusicHackDay.org. Music Hack Day is an international 24-hour event where programmers, designers and artists come together to conceptualize, build and demo the future of music. Software, hardware, mobile, web, instruments, art – anything goes as long as it’s music related. Hack days have special requirements: don’t just trust anyone who tells you that “it’ll be fine”. Think about the networking issues, and verify that they work for the kind of capacity you are going to have. People from the venue or their commercial partner will tell you all sorts of things you want to hear but keep in the back of your mind that they may not have any clue what they are talking about. Given the importance of network access, if you are operating a commercial event consider requiring network performance as part of your contract with venues and suppliers. Avoid sexism and other discriminatory language or attitudes. Don’t make any assumptions about your attendees. Get someone who is demographically very different from you to check your marketing material through to see if it makes sense and isn’t offensive to someone who doesn’t share your background. Read The Hack Day Manifesto. If you agree with the sentiment, and you have enough hacker juice to fork the manifesto, edit it and send a pull request, you are invited to add yourself to the list of supporters. Why do Music Hackers hack?